Welcome to Americas Best Value Inn Columbus Texas known as the City of Live Oaks and Live Folks. Our hotel is located on Highway 71 and Exit 696 off of I-10 a convenient location when traveling between Austin and San Antonio to Houston Texas. Start your day off right with our free continental breakfast and free coffee in our lobby. We offer both free wireless Internet access and free hard-wired high speed internet access in all of our guest rooms. Business travelers will be sure to take advantage of our free fax and copy services located on-site. Appreciate the convenience of our guest laundry facility. Our smoking and non-smoking guest rooms feature amenities including microwave mini-fridge coffeemaker hairdryer flat panel TVs with HBO and ESPN iron ironing board and wake-up service. Select guest rooms are handicap accessible. After a day of work or play take a relaxing swim in our seasonal outdoor pool open from the end of May to November. Pets are welcome- restrictions and charges apply. There are many dining options located near the hotel that offer the best of Texas-including Nancys Steakhouse Los Cabos Mexican Grill and Mikeskas Bar-B-Q. Explore nature at Stephen F. Austin State Park or stop by the Santa Claus Museum for a unique gift. Catch the road track excitement at Lonestar Motorsports Park and dont forget to bring your swimsuit for outdoor fun at Howell Canoe Livery and Splashway Water Park. At Americas Best Value Inn Columbus We ve Got You Covered from the time you hit the road until your head hits the pillow. Welcome to Americas Best Value Inn Columbus Texas known as the City of Live Oaks and Live Folks. 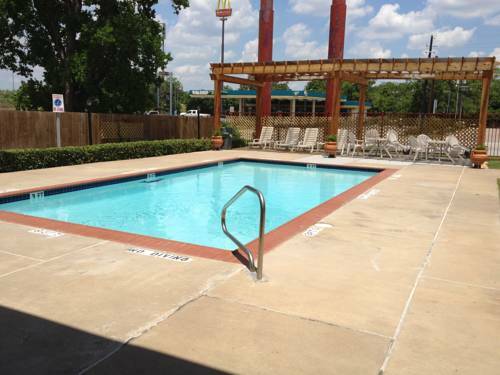 Our hotel is located on Highway 71 and Exit 696 off of I-10 a convenient location when traveling between Austin and San Antonio to Houston Texas.